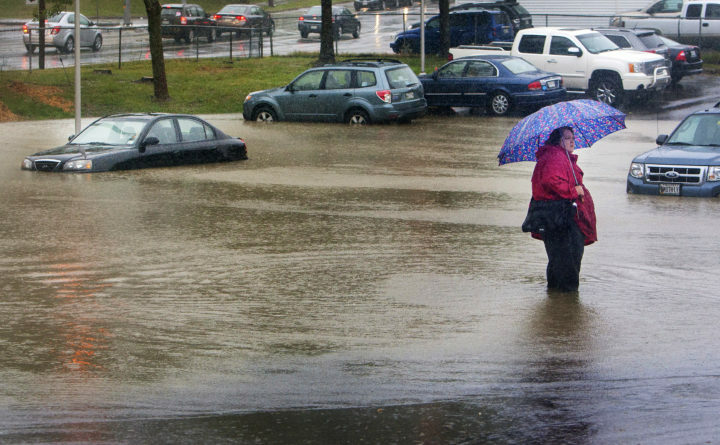 A woman wades out in water while trying to figure out how to move her car in the Eastern Maine Medical Center parking lot in Bangor in this BDN file photo. CBS 13 Chief Meteorologist Charlie Lopresti is forecasting a storm Thursday night into Friday morning that could cause flooding around Maine. Wednesday is the first day of spring and it’s lovely outside. Highs will make it into the 40s. A southerly wind will result in coolest temps felt at the coast. Thursday is looking mainly cloudy as our next storm system approaches. Expect rain to develop Thursday night and extend through Friday. Late week storm should bring mostly rain to southern and central Maine. Highest elevations in the mountains and Northern Maine could pull off a big snow event. Some wet snow is possible area wide to end Saturday morning. The heaviest rainfall should be Friday with the potential for over an inch of rain. River levels will need to be monitored as melting snow and rainfall runoff may push some rivers to bank full. The other variable to monitor will be the potential for coastal flooding. Tides are running astronomically high due to the full moon cycle late week. Beach erosion, splash over, and the potential for minor coastal flooding will need to be monitored. It’s looking like the best chance for snow Friday will be in the mountains and the higher elevations could experience a sizable snow event. Inland towns may experience some wet snow as the storm pulls away Saturday morning. The afternoon looks mainly cloudy. Sunday should be the pick of the weekend with plenty of sun and seasonably mild temperatures. Highs will make a run at the low 50s this Maine Maple Sunday. A cold front will touch off rain and snow showers Monday. Stay tuned. Charlie Lopresti is CBS 13’s chief meteorologist. His full forecast can be found here.